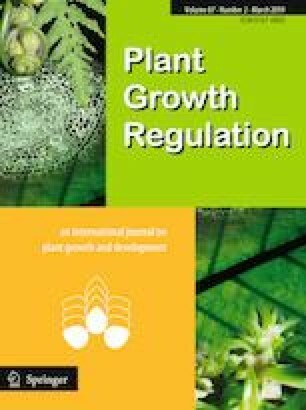 The postharvest longevity of gerbera (Gerbera jamesonii) flowers has a critical importance in determining their commercial value; and therefore, there is a commercial demand for prolonging their vase life (VL). Here, we tested the efficacy of salicylic acid (SA, 150 µM) preservative in extending longevity of cut flower of two gerbera cultivars, namely the ‘Sunway’ and ‘Bayadère’, of which water-held ‘Bayadère’ has longer VL than water-held ‘Sunway’. The results indicated that exogenous SA could significantly prolong the VL of cut flowers of both ‘Sunway’ and ‘Bayadère’ cultivars, with better preservative effect being observed on ‘Sunway’. SA preservative was more effective in ameliorating relative water uptake and relative fresh weight in ‘Sunway’ than in ‘Bayadère’, which was accompanied by a greater decrease in proline accumulation. Application of SA prolonged the VL of two cut gerbera flower cultivars by inhibiting the activity of polyphenol oxidase involved in browning reaction, and decreasing oxidative stress through improving reactive oxygen species-scavenging antioxidant capacity, which included accumulation of total phenolic compounds and total flavonoids, and enhancement of enzymatic antioxidant activities. As a result, membrane lipid peroxidation levels were reduced in cut flowers of both cultivars, with higher reduction level being observed in ‘Sunway’ than in ‘Bayadère’. Additionally, SA preservative was more efficient in maintaining a greater content of total soluble proteins in ‘Sunway’ than in ‘Bayadère’. These findings clearly demonstrated that SA has higher preservative effects on extending VL of ‘Sunway’ than that of ‘Bayadère’. Taken together, SA can be recommended to farmers for postharvest treatments to maintain quality and delay senescence of gerbera flowers. We would like to thank the Graduate School of Lorestan University, Iran, for providing facilities. MNE and RK designed research; SS performed research; MNE analyzed data with the input of L-SPT; and MNE and L-SPT wrote the manuscript.